While blasting the air may feel great on a sweltering summer day – your resulting energy bill can leave you sweating later! Keep in mind that for every degree you raise your thermostat above 72 degrees, you can save 3% on your energy bill. So use these tips to stay cool and save money! You can keep your home cooler without turning up the thermostat simply by reducing the amount of sunlight coming into the house. Draw shades and close blinds – especially during parts of the day where sunlight tends to enter the windows and warm the house. And If it gets cool at night where you live, consider turning off the air conditioning and opening the windows. The following morning, close the windows to keep in the cool air. Installing energy efficient window coverings will also prevent heat gain through windows and keep rooms cooler longer. Remember that grill you use on Memorial Day, the Fourth of July and Labor Day? If you also use it on days in between the holidays, you can reduce the heat generated in the home from cooking. Using ovens and stoves can raise the temperature in the home by up to 10 degrees so cooking outside, or making use of your microwave, can help save a significant amount on your cooling bill. Be aware of the area surrounding the thermostat in your home. Does it have a computer, lamp, television or other heat-generating device nearby? 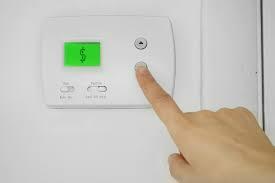 If so, your thermostat might be misreading the overall temperature in the house – and working overtime to compensate for the heat emanating from electronics. If possible, remove these items from the area surrounding the thermostat – and enjoy the savings! Fans can be a great way to save on your energy bill. Using a ceiling fan or stand-alone fan will enable you to raise the thermostat about 4 degrees with no discernible difference in temperature. But remember to turn off fans when leaving a room as they are designed to cool people by creating a wind chill effect but they do not cool rooms.